Williams Grand Prix Engineering Ltd certainly needs no introduction when it comes to motor sport. Ever since Frank himself parked his bum in his first racing car, a year has not passed when there was not Frank or his car on a grid somewhere. Since 1975 Williams themselves have been one of the more durable names in Grand Prix racing. Although currently in limbo, there was a time when Williams were at the cutting edge of F1. 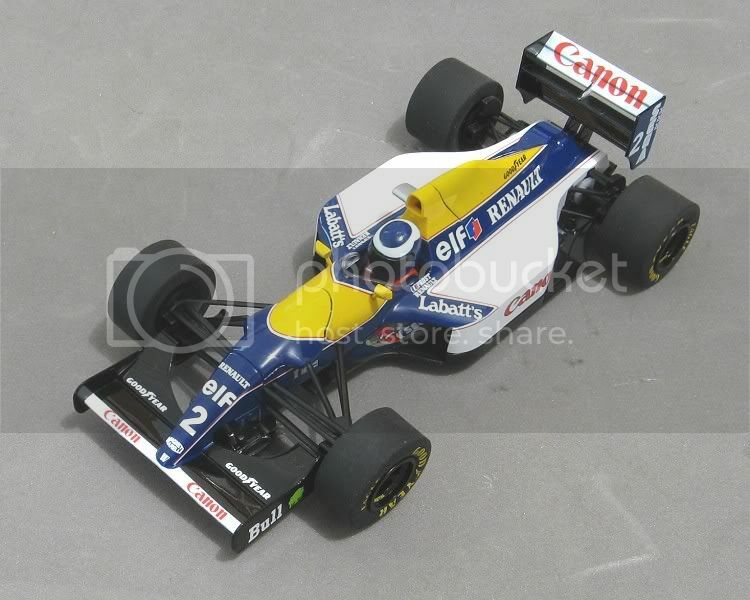 This period encompassed the year when the FW15C was raced. Frank had fallen out with Alan Jones and Riccardo Patrese had also moved on. 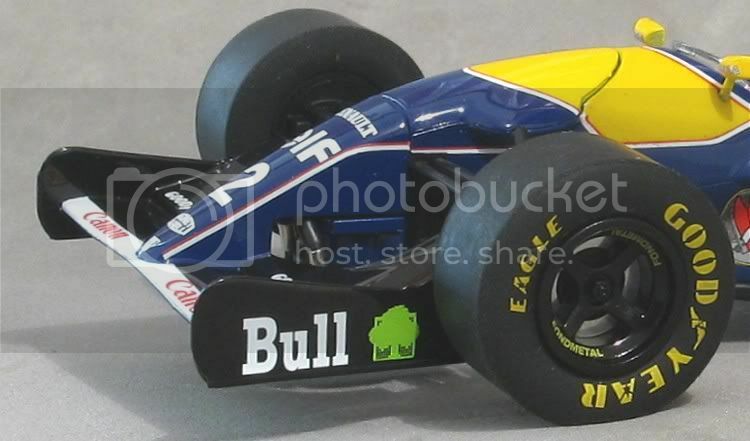 This left a couple of vacancies in the Williams team and Prost signed an exclusive one year contract, having spent 1992 on the sidelines for a self induced sabbatical. Mika Hakkinen was discussed for the spare seat but eventually Damon Hill, son of Legendary sixties driver Graham, who had been testing cars for Williams for a couple of years, was moved up into the number two spot. 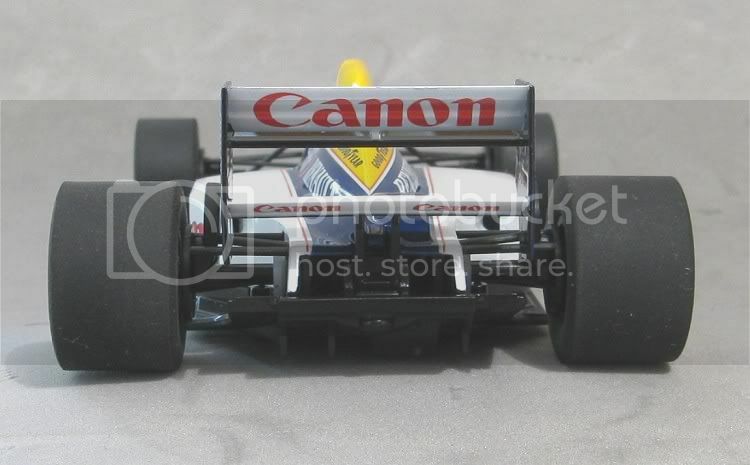 With Patrick Head and Adrian Newey building the cars, 1993 saw the most advanced racing car ever built rolled out in the Williams Cannon livery. The car included a host of features, many of which were to be banned the following season. The Renault V10 engine was bomb proof and unapproachable, producing more than 30 bhp more than the Ford engines of their closest competition and vastly more economical than Ferrari’s V12. Needless to say Prost and Hill blitzed the season, Prost took the drivers championship and Williams took another constructors championship. As mentioned before, the goal posts were moved at the end of 1993, and all teams had to start again from scratch. 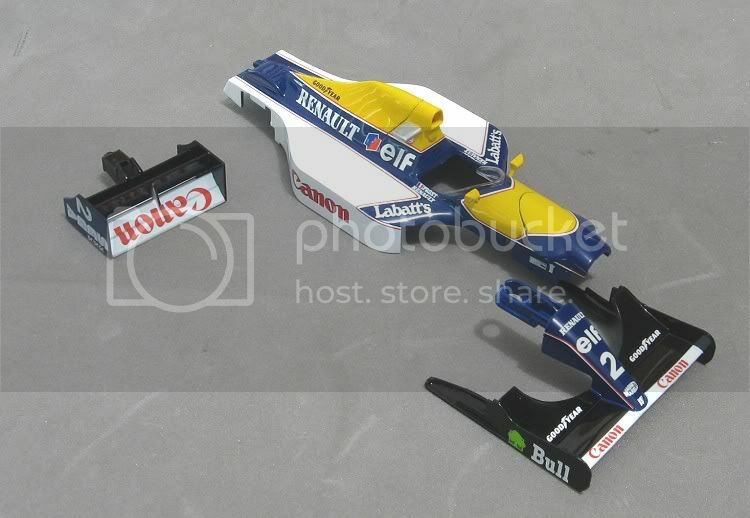 Scalextric are no strangers to Williams. 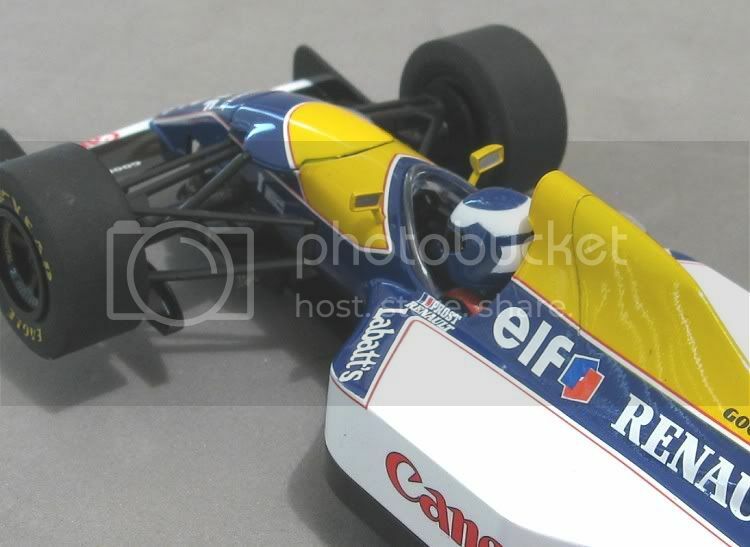 In the nineties they made the Mansell number five car which preceded this model, and side by side it is really quite remarkable how good the Mansell model was. 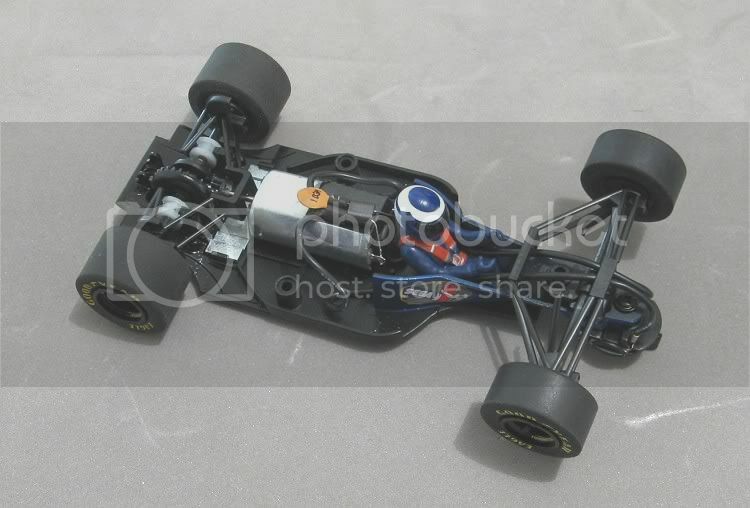 In the early eighties they also reproduced the FW07 to great acclaim and that is still one of my favourites for Red Team racing. So what have they done with this one?........ let’s take a look! Wheels are very good, having hardly any run out or eccentricity. The front tyres could probably do with a little sanding, but the rears are fine and the lightest of sandings should see them ready to run. The tyres are also the same fit as a lot of previous Scaley F1’s, having the narrow ridge in the centre of the wheel, which is handy, and as a consequence, the generic MJK Classic Scaley F1 tyres pop straight on. The printing on the tyre looks like tampo and as such, should prove more durable than some of their earlier offerings. Suspension detail is convincing and smaller detail like brake ducts are included in the mouldings. 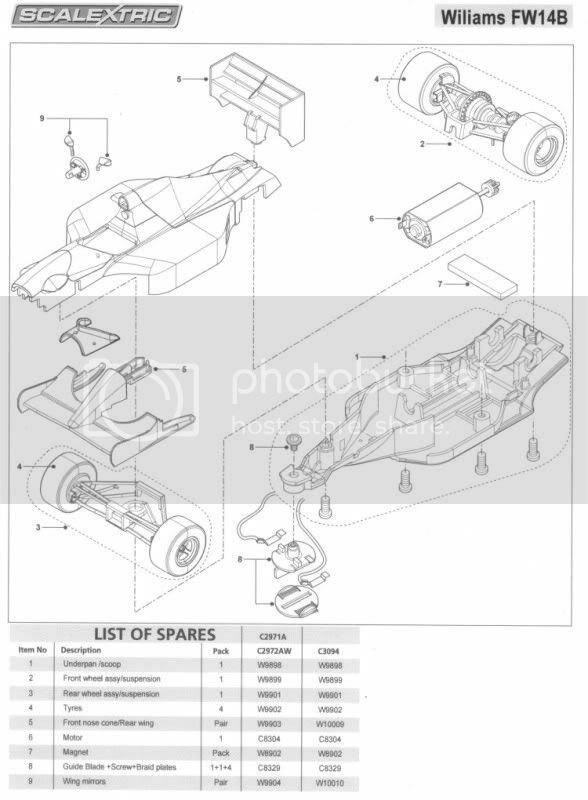 The front wing is fairly substantial, and I think it would have to be a fairly heavy shunt to do permanent damage to it, unlike the rear wing which is held on by a tiny two gauge screw which does look vulnerable, but Scaley have included these in their parts list (W10009). Lastly on the topside, it’s nice to have an open wheeler without a camera pod to be broken off; and the rear view mirrors are inside the roll over zone which should contribute to their longevity. Underneath, the model reveals little, but there is little to reveal and as usual it is a very business like underneath, so off we go to the inside to see what has happened there?. Again, no real innovation, but the reassurance that this model does appear to be a bit more resilient than some of the more recent GP cars. Alain looks a little dowdy, but if you are handy with the paintbrush you could quite easily instil a little more vibrance into his appearance and possible brighten up the sparse cockpit! All else inside is familiar and why change a winning formula. Again there is a stepped magnet in situ between the motor and the contrate and it is quite high off the track. Although there feels to be enough downforce on Scaley plastic track, it might be necessary to replace it with the plain bar magnet as found in some of their other models if you are racing high speed tracks; these should be available as a spare part from your Scalextric retailer. On reassembling the model I found there was a bit of resistance in getting the tub to sit squarely on the chassis. 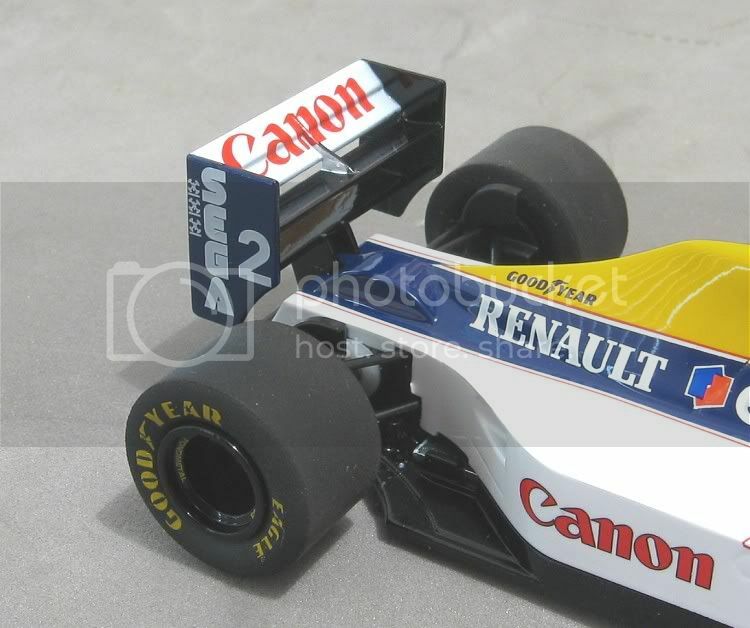 I had this with the Renault GP car (see review) and to de-stress the chassis I spent a little time getting parts to snap neatly together without using the screws to pull the parts together. This will pay dividends as the last thing you want is a body/chassis under tension. This will manifest itself as a loss in performance!! The lead wires are also binding in the nose of the model. This stops the body fitting properly without the screws and also puts excess tension on the guide movement, which in turn could cause unpredictable guide behaviour, especially in tight corners. The rear axle is a bit sloppy. Almost all of this is caused by the axle being loose in the bushes themselves. I believe these axles have knurled ends to them which cures that old Scaley problem of wheels coming off. But, as the knurling is a greater diameter than the axle, the bushes as a consequence, have to be more loose to pass over it!. Making them loose when in place?? The front axle also rides off the track surface on plastic track which has raised conductor rails like Scaley, SCX etc. and barely touches the track on board track. Not a big issue really, as both axle widths are a whopping 67 millimetres!! So this should be a safe model to race, there are no major innovations and the model has most of the traits of past successful Scalextric models. I have taken this one out for a spin and the following observations were present during my tests. On Scalextric track the axles are that wide that they seem to get caught up in all sorts of trackside scenery and fences. Not to mention any model on adjoining lanes!!. 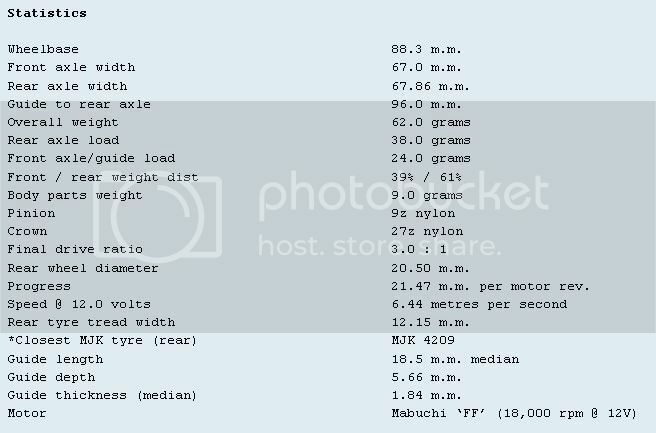 It’s performance is good a far as the FF motor goes and it has good acceleration and braking. The motor does seem to like lower ohmage hand controllers though. With the standard Scaley ones you seem forever to be at the full throttle end of the trigger position. 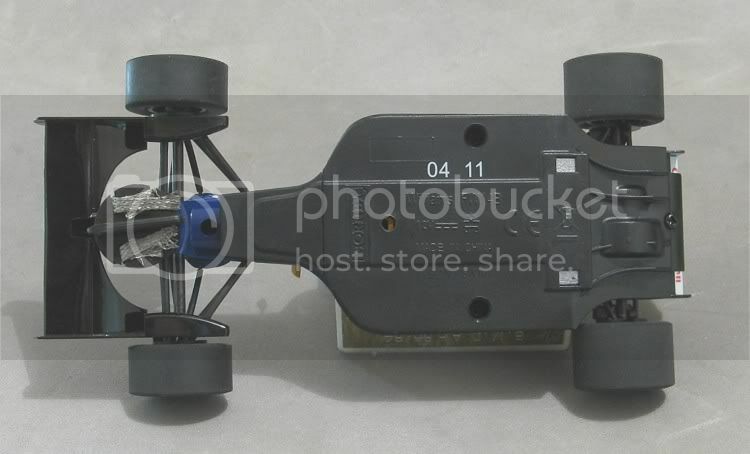 On taped or braided board it behaves well and drives well, there is even enough room under the body to add a little ballast, unlike the current F1 models. With a light tyre sanding and a sensible approach to the medium, it does drive well and you soon find yourself lapping at a good rate! 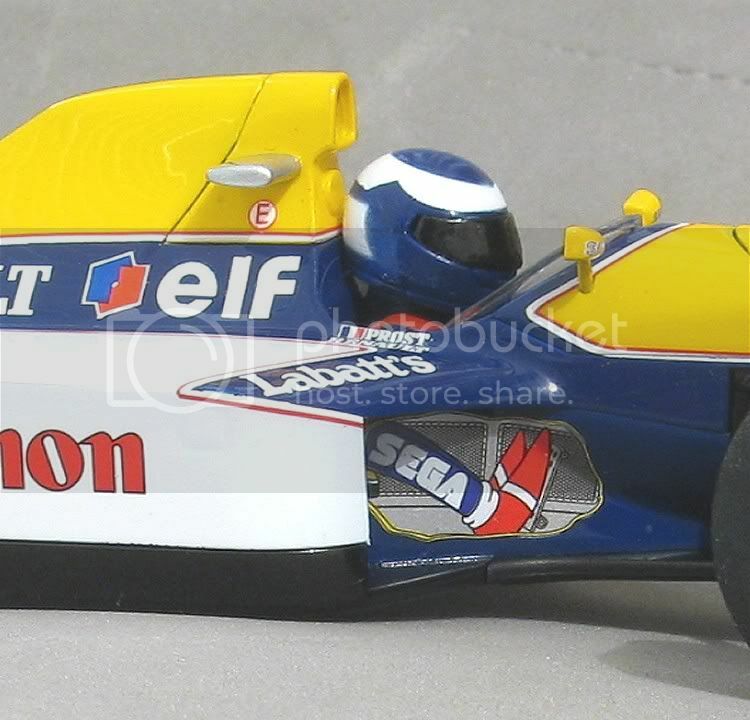 This is a very nice model in one of the classic liveries. If you spend an hour or so on it you will get it to fly on plastic. On board it will also be competitive in its class along side like models. But as a racing model out of the box it is as good as but no better than a host of similar models. 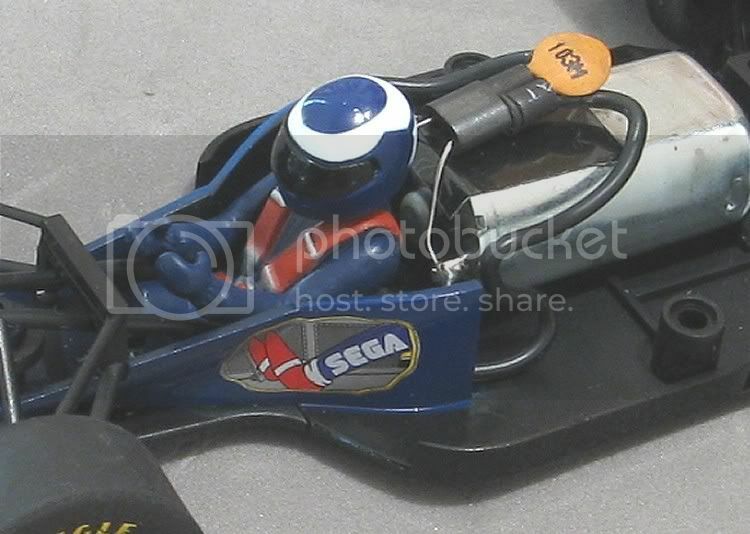 As an open wheeler it should perform quite well against its sister models such as the A1 GP’s and the Indy cars. I bought this model to race, and race it I will. So, you might need to come back from time to time to see how it has been getting on! Took the Williams for a run today on a fast but technical non magnet board track (see features - Mt Ommaney) and it was great. After a few warm up laps the model was soon flying and was just heaven to run, straight from the box!, no ballast!, no tyre sanding or changing! 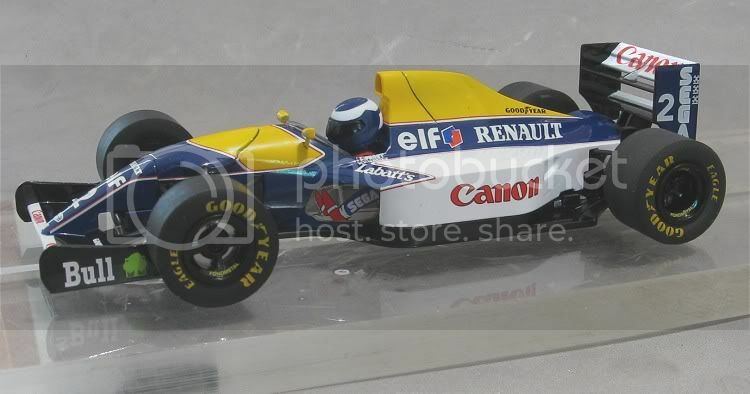 I also tried out a friends 05 Mansell car from the twin pack and this had urethane MJK's on it. That model was, at a guess, 0.5 secs or so faster than mine (approximately an 11.0 sec lap) and after several minutes of running my own I tried a drop of CRC on the tyre rubber. Needless to say the model develeoped wings and it was only the inability of my kneck muscles to keep up that caused me to desist!! In all seriousness though, the model straight from the box has proved to be a very capable model. It should be every bit the equal of the A1GP's and the Indy cars! !